While mobile internet is growing in India at healthy pace, there are still millions of Indians who do not have internet on their mobiles. Primary reason remains that majority of Indians are still on feature phones that do not have internet. For smartphone users, who have internet maps and directions are very important features. If you are new to a place, or want to get from place A to place B and do not know the directions to reach there, smartphone users can simply open Google maps (or any navigation app) to find directions. However, what happens if you do not have mobile internet or GPS? txtBrowser, world’s leading SMS search engine by Bangalore based Vavia Technologies has found solution to the problem. They have launched a feature that allows you to get directions just by sending an SMS. To find directions on SMS you will need to do the following. 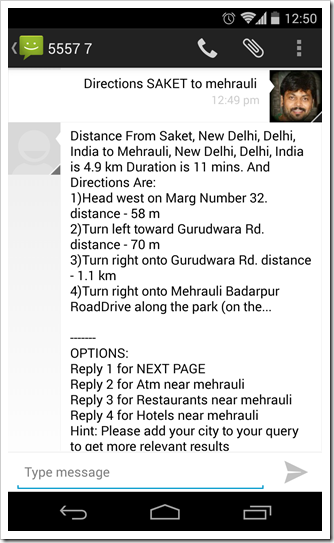 So, for example, you need to go from Saket to Mehrauli in New Delhi, you will get back following SMS once send the SMS in proper format. Here is actual screenshot of that query. This can be an extremely useful feature for mobile phone owners who do not have mobile internet or smartphones in their hand. Same Short code not available for all networks? While testing out this feature, we had to change our number from 55444 to 55577. When we sent the query to 55444, we did not get any response. After looking up on their site, we came to know that on Idea Cellular network, one needs to use a different short code, which was 55577. Once we used it, the feature worked like a charm. txtbrowser can be used for number of reasons other than directions. You can send an email to any email ID through SMS. You just need to send following string as SMS – email <email ID> text of email. The email will be send immediately, and the recipient will get a email like shown below. That’s a wow feature and almost sure it will help people to get the direction when they are on unknown destinations. By the way, I guess you mistyped in the 3rd para and the 2nd line…”found problem to the solution”. Shouldn’t it be like “solution to the problem”?